In my last entry I pointed out some of the reasons why the information deluge on the web and the worldwide thirst for knowledge is driving the development of MT technology and only touched upon why this might matter to Language Service Providers (LSP) and the professional translation industry. I thought it might be useful to expand on this. It is useful to summarize some of the key trends in the professional industry as they provide a useful backdrop for why the need for more automation will only continue to build momentum. I am told that SDL originally stood for Software and Documentation Localization. The world has changed and the increasing source data volume, falling prices and the increasing value of dynamic community-created content suggests that changes are needed.The list below explains this further. -- Corporations are facing an increasing demand for translated content without significantly higher budgets. It is possible that the increase in source content volume could be anywhere from 5X to 100X historical volumes. The internet has been instrumental in increasing the demand for large amounts of multilingual content. -- The sustainable price per word rate has steadily declined over the last 10 years and buyers are still demanding greater productivity. -- Much of the industry is currently optimized around the TEP process and project management skills. -- Translation Memory technology is now widely used by agencies and translators those who work with moderate to highly repetitive source content and there is growing momentum to centralize this. -- Translation Management Systems (TMS) are increasingly being used to manage the growing workloads and improve project management efficiency. -- The importance of communities and collaborative models are gaining momentum by the day. Crowdsourcing is seen as a legitimate and efficient way to do certain kinds of projects. -- The value of speed and agility is increasing all the time as we enter the real time internet world. = We need it translated NOW! -- The value of static content that has been the focus of professional translation continues to decline and many global corporations see that dynamic knowledge content and community content has much higher value to the global customer e.g. iPhone ships worldwide without a manual. -- Long standing industry experts have pointed out that current approaches and processes are outmoded and that translation automation technology needs to evolve to keep up with the rapidly growing information needs of global customers. 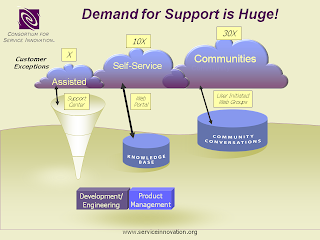 The Consortium for Service Innovation whose members include Dell, Symantec, Cisco, Microsoft and others, provides some very compelling data on how the customer support reality is changing for a typical IT company that produces a software or hardware product for the global market.The graphic above shows that customers in the IT industry get 40X the support from self service knowledge bases and communities than they do from the documentation and the direct customer support organization. The picture above shows how major corporations focus on the relatively low value, static content even though there is increasing evidence that customer loyalty is built elsewhere. This is slowly changing and it can already be seen by the increasing use of MT by market leaders like Microsoft, Intel and Cisco to widely distribute support information even though it is sometimes raw MT. 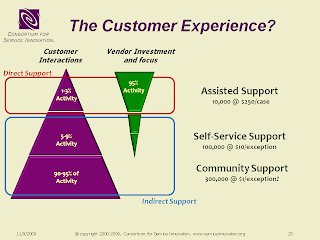 The ROI in creating more self-service and community content is huge as can be seen from these diagrams. As these forces gather it becomes increasingly important for an LSP to be able to help their customers respond to the much more dynamic world. How many LSPs have been involved with large knowledge base translation projects? Why not? Clearly automation is necessary and a different more collaborative process is required. Global enterprises are being driven to understand and use community content, and constantly changing support requirements to engage global customers. LSPs that have the skills and knowledge to help with this will be seen as valued partners. Many say that SMT is in some sense a much more flexible and robust TM technology and will now be much more easily used and deployed with tools like Language Studio Pro. These domain focused MT systems improve over time and can thus become a strategic asset that enable an LSP to respond faster and at lower cost than otherwise possible. LSPs with good quality MT systems become valued partners for every global company interested in that domain that enable a much broader dialogue with global customers. However, it requires an investment to get to this point. MT will also open up completely new markets for the professional translation industry as major Publishers begin to realize that they can make high value content usefully multilingual at much lower costs, and in a much faster timeframe. At every step, the leaders will be those companies that learn to use these tools well and also engage translators in this process as they are necessary and critical to producing high quality. There will be a need for new kinds of people, some with deep linguistic skills who identify translation error patterns and develop corrective strategies, and and there will also be a role for less skilled monolingual post-editors. MT can also enable improved productivity and standardization on large localization projects. MT engines can leverage all future projects in the same domain or for the same customer. In some cases the availability of imperfect MT output can also trigger and create human translation demand e.g. patents. Most of all I think that LSPs that learn to use MT effectively become true globalization partners who are engaged in many international initiatives wherever new languages and new multilingual content can drive new market growth. I predict that 2010 will be a year that we see some LSPs develop definite competitive advantage using their knowledge and expertise with MT as a key differentiator. There is an excellent audio-visual presentation (requires registration) that describes the technology and provides some specific use scenarios for LSPs interested in exploring this further. I don't disagree (with the comment you left on my blog). You do have a point, definitely. But what about the human quality? Can this ever be replaced? I do not suggest that MT is a replacement for human translation. I think we all agree that if it really matters and if any kind of linguistic finesse is required competent humans will always produce better quality translations.